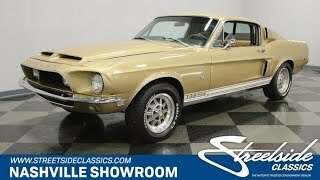 Hi, I am interested in your 1968 Ford Mustang Shelby GT500 (stock #1078-NSH) listed on Autotrader for $152,995. I'd like to get more information about this vehicle and confirm its availability. This car is very rare, very correct, and very well done. So be sure to check out the binder full of documentation that includes a very thorough professional appraisal report as well as the Marti Report, the original invoice, the factory build sheet, restoration photos, and receipts for those details. Sunlit Gold is not only a beautiful color, its one you dont see too often and is the factory correct code 3073-A color for this car. The fenders, quarters, and floor pans are all original and the paintjob is a very well executed BC/CC with restoration photos documenting the job nicely. Correct Shelby GT500 badging starts up front with Shelby in letters. Fog lights are set in the grill and all the chrome trim as well as the bumper shines bright. The hood has a big double scoop to gather up air for the beast within, is held down with twisting hood pins, and has vents to let the hot air out. There is a Shelby Cobra on the front fender and GT500 stripes in white along the rockers. The view from the rear is unique Shelby with six chamber sequential taillights on each side of a Cobra gas cap with Shelby in script on the trunk lid and dual chrome exhaust tips peeking out from under the bumper. The car sits on the dealer optional 10 spoke wheels with Cobra centers and fresh Cooper Cobra tires. Open the door and you will find the code 6F Saddle Dcor group interior that compliments the Sunlit Gold nicely. The door panel sets the theme in a two-tone treatment with a woodgrain panel trimmed in chrome piping and ribbed chrome dresses out the bottom. The original and correct two-spoke steering wheel with a Shelby center is mounted on a swing-away column. The dash is stock and super clean with a wood grain upper with all the chrome trim and controls looking good and shining bright. Ventilation controls include those for the factory optional Selectaire air conditioning which was only available in conjunction with the automatic transmission. So, the T-handle for that trans rises out of a beautiful wood grain center console that includes Stewart Warner gauges for oil pressure and charging amperage at the front with a nice Cobra armrest on top of the storage compartment. The seats are freshly recovered and the factory roll bar sports the original, and matching, shoulder harnesses. Open the hood and you will find one of those precious 428 Cobra Jet engines nestled down in an engine bay as nicely restored and detailed out as the outside of the car. It starts with the oval Cobra air cleaner sitting on top of the C8ZF Holley 4-barrel carburetor with its tag still in place. A C7AE cast iron intake sends the mixture to a date correct engine along with Cobra LeMans crinkle finish finned valve covers that help keep the oil cool. Original exhaust manifolds get the spent gasses out and power flows back through that C6 automatic trans to the traction-lok rear end. The chassis is nicely painted and detailed out too and all the suspension components are new. Power steering and power front disc brakes assure that you can maneuver and stop this car easily and effectively and the rubber meets the road through 325/60R15s mounted on those gorgeous 10-spoke wheels. Very desirable and nicely restored with extensive documentation. This one could be yours. Come on down and check it out.